Colorful, storybook edging for borders and beds. 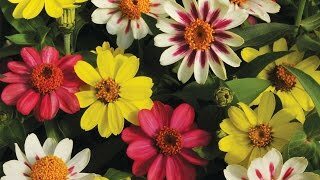 Look for a gorgeous spread of continuous color to add enchantment to the border. All-America Selections winner offers up mounds of rich, violet-purple blooms. Sow twice a year for almost continuous bloom. Alyssum may be sown directly in the garden after frost or planted as a potted plant. Direct sow seeds in average soil in full sun to part shade after danger of heavy frost. Sow seeds 6 inches apart and barely press in; light aids germination. Firm soil lightly and keep evenly moist. Seedlings will emerge in 8-10 days. Shear plants back by one-half after the first flush of flowers has ended to encourage new buds to form. Plants self-sow so allow some to set seeds. Alyssum performs best in areas with relatively cool summers, but can grow anywhere. Alyssum makes a great temporary ground cover and grows nicely with dianthus, violets, and thyme. Plant alyssum between stepping stones or in paving cracks, or grow it in containers. Alyssum also makes a great addition to a butterfly or seaside garden. Alyssum has a sweet fragrance. Plant where you can enjoy this, such as in a window box. Because of the fragrance it will also attract bees, butterflies and many beneficial insects such as lady bugs. Alyssum, Royal Carpet is rated 3.8 out of 5 by 6. Rated 5 out of 5 by natalie226 from First flowers to bloom I planted all my seeds the same day, and these bloomed first. It encouraged me as I waited for the others. I love the color variety. Rated 5 out of 5 by MSF0226 from Beautiful Flowers I had a lot of luck with this seed product. I grew in containers and the flowering began about 2 weeks ago and hasn't stopped. Great product! Rated 4 out of 5 by GaGardener from Germinated well These germinated well for me. Rated 2 out of 5 by Minda from Not growing The seeds have sprouted but are not growing- they've been the same height for weeks. What gives? I don't have money to waste. Rated 2 out of 5 by Birdie from Surprisingly weak Alyssum is typically super easy and ridiculously prolific. With this one, I had very little germination and the seedlings died in a little wind.